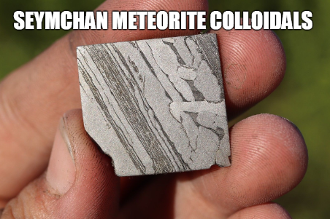 Seymchan is a pallasite meteorite found in the dry bed of the river Hekandue, a left tributary of river Jasačnaja in the Magadan district, Russia, near the settlement of Seymchan, in June 1967. The main mass of 272.3 kilograms (600 lb) was found during a survey in June 1967 by geologist F. A. Mednikov. The mass was a triangular-shaped thumbprinted meteorite lying among the stones of the brook bed. A second specimen of 51 kilograms (112 lb) was found with a mine detector at a distance of 20 m from the first in October 1967 by I. H. Markov. The main mass was turned over to the Academy of Sciences of the USSR. During a new expedition in 2004, Dmitri Kachalin recovered about 50 kilograms (110 lb) of new material. Remarkably, about 20% of the new specimens were found to contain olivine crystals, and so revealed the silicated nature of the meteorite. The pallasitic structure was not previously discovered during studies on small metal-only sections of the original mass. Seymchan belongs to Main Group pallasites, but it is considered anomalous due to its high Iridium content. Before the discovery of its pallasitic structure it had been classified as IIE anomalous coarse octahedrite. Seymchan is considered a stable and rust-resistant pallasite. Due to the heterogeneous structure of Seymchan, there are two types of specimens: with or without olivine crystals. It is worthy to note that the specimen pictured to the left shows an interesting, seldom seen feature of iron meteorites. The Widmanstätten pattern on the left hand side of the specimen is visibly bent. This is caused by the shearing of the meteorite as it broke up during atmospheric entry and serves as testimony of the violent experience a meteor is subject to as it falls through the atmosphere. There are ‘patterns’ in the different types of meteors, in the Gibeon there is a gorgeous crystalline patterns known as Widmanstatten patterns, which is unique to meteorites. These patterns can only form over millions of years of cooling. It is such a unique condition that scientists cannot copy it here on Earth. These patterns actually tell a scientist how long it took for the molten meteorite to cool. It has been estimated that it took about 1000 years for these molten pieces of planetary core to cool by just 1 degree Celsius! Only meteorites exhibit the Widmanstatten pattern and each piece of meteorite has its own unique pattern. Lines and patterns are the result of cooling in outer space over billions of years and etching slices with dilute nitric acid allow these patterns known as “Widmanstatten lines” to be more visible. Meteoric iron is used for alignment and balancing; it symbolizes the aptitude and strength required for endurance. Nickel is thought to purify the blood and increase the body's iron content. Stress is meteorite central. Uranus rules the parasympathetic nervous system, shocks, trauma and unexpected events that upset us. Like cures like. If you’re stressed out, traumatized, ect., with a transit or progression of Uranus to your natal chart, wearing meteorite can actually calm you down. It’s a destressor. This energy brings “light” bulb time to our jammed up/clogged up and constipated right hemisphere of our brain. It ‘sheds light’ so that we figure out another way to overcome a hurdle and get on with our lives. Or with an idea or project. You might say that Meteorite is the lightning of the gemstone world; it unclogs the debris in our right hemisphere so that we’re flushed clean with new possibilities. When the psychic channels of the right hemisphere are cleaned out, amazing new ideas, intuitions and hunches can once more flow with ease. When you consider meteorites were once part of a planet, we can look at it metaphorically. What in your life needs to be recobbled, redesigned, blown apart and put back together again? Has your life suddenly blown up like this planet? Are you feeling as if you are nothing but fragments of your former self? Many of us experience a breakdown in order to get a breakthrough. This can be on any level: physical, mental, emotional, spiritual, or a combination. If you feel your world is literally exploding apart and you are traumatized and paralyzed by the changes, Meteorite is just the energy you need. It can help you redesign your life.